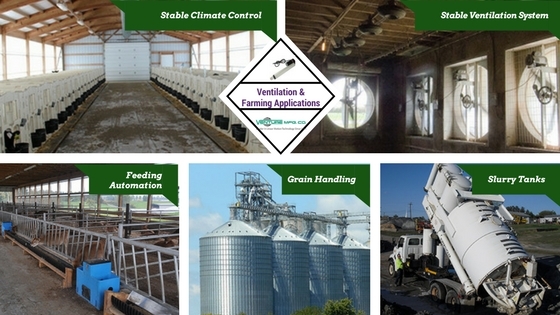 5 Ventilation and Farming Applications Using Linear Actuators - Venture Mfg. Co. Farmers rely on a variety of farming equipment and advanced solutions to improve their profits from agriculture. These equipment allow them meet various agricultural challenges, as well as minimize their dependence on weather, and labor. Most of the modern-day agricultural equipment are designed to provide maximum comfort to users, and are actuator-driven. Linear actuators are one of the most common types of actuators, which are used to improve versatility of agricultural applications. This post discusses five such linear actuator driven agricultural applications. Ventilation Systems in Stables: Food and vaccination are two important elements that aid livestock to flourish. However, there are certain other elements that protect them from draught. These include proper airflow, appropriate temperature control, and CO2. These conditions are usually controlled using linear actuators. Various advanced actuator solutions help ensure perfect climate inside these stables. Many advanced actuators provide excellent positioning, and feedback. Slurry Tanks: Manure handling is a very difficult and risky task. Over the years, farmers have been experimenting with various systems to handle manure at their farms. Nowadays, they prefer systems equipped with electric linear actuators that help them transfer manure over a safer distance at a touch of button. Feeding Automation: Animal feeding is one of the important tasks performed by farmers. Correct feeding dosage is very important aspect of farming. Hence, today farmers are relying on automated systems that help them with precise dosage. Most of these systems are driven by electric linear actuators. Stable Climate Control Systems: Most of the modern animal stable systems are equipped with accurate climate control equipment. Nowadays, these systems feature actuator solutions that help with easy temperature regulation, as well as opening and closing of ventilation. There are many other farming applications that are benefitting from advanced actuator solutions. If you wish to purchase them for your ventilation and farming systems, you can approach a reputed solution provider such as Venture Mfg. The company provides advanced linear, electric linear, and electric actuator systems for agricultural industry. These actuator solutions are suited for a variety of applications that help improve lives of farmers.